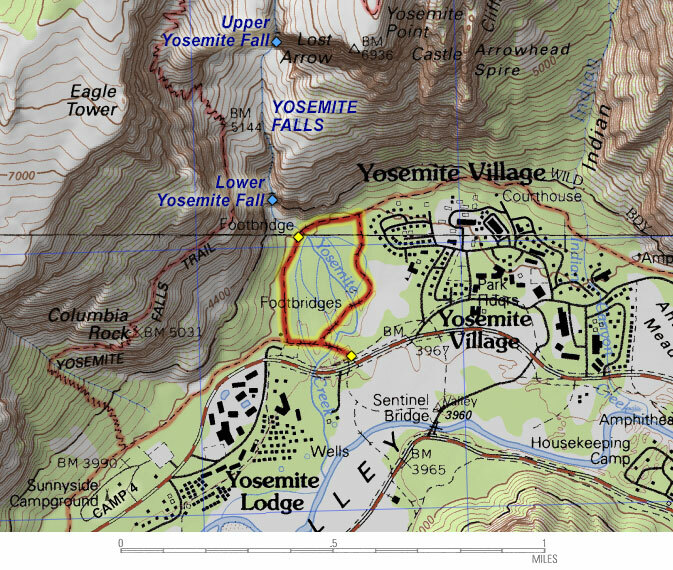 Starting at the Lower Yosemite Fall Trailhead (located ¼ mile west of Yosemite Village), the easy-to-follow paved trail loops through the forested valley floor to a large hikers bridge and viewing area just south of the base of the falls. (The eastern loop of this trail is wheelchair accessible.) Because this trail sees many, many tourists, please stay on the trail to preserve the delicate Yosemite Creek landscape and vegetation. Seasons: Year-round. The trail is accessible in winter, but conditions can be unpredictable. The Lower Yosemite Falls Trail is open year-round, but the most exciting time to visit is spring to early summer when snowmelt from the high country has Yosemite Falls running at peak. 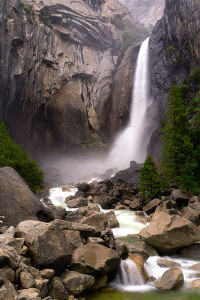 (Be prepared to get slightly wet from the mist coming from the falls.) By late summer and fall, the waterfall is down to a trickle. And while this trail is officially open in winter, snow and ice can be unpredictable. This is one of Yosemite's hallmark tourist attractions, especially during the spring runoff when the awe-inspiring Yosemite Falls is flowing at its most powerful. The only downside is that just like the rest of Yosemite Valley, this stroll is *always* crowded. Every single tour bus and recreation vehicle wants to stop here and wave after wave of people will take this stroll. Be prepared to share the trail and viewing area with hundreds of your best friends.